Deltamarin, a designer of ships for marine and offshore industries, has signed a contract with Rauma Marine Constructions Oy (RMC) for the design of a Liquefied Natural Gas (LNG) powered car passenger ferry for Kvarken Link AB, a Finnish-Swedish consortium. The contract brings to fruition the acquisition process that began with public procurement process initiated June 2nd 2018 between Kvarken and RMC. Deltamarin’s commission covers basic and detail design services for all hull and machinery areas. The value of the contract with RMC is about €4M (USD 4.5M). The work will be carried out over a period of 13-14 months at Deltamarin’s offices in Finland and Poland with the assistance of network companies. The ferry will have a freight capacity of 1,500 lane-meters for trucks on two cargo decks and accommodate 800 passengers. She is designed to have a low environmental impact, with machinery running on a dual fuel and battery solution. The main source of fuel is LNG. The vessel will also be able to utilise liquefied biogas (LBG). To guarantee her ability to navigate independently during winter time in the challenging ice conditions of the Kvarken region, the LNG-fuelled ferry will have an ice class of 1A Super. 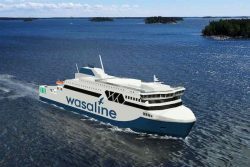 The ferry is planned to be delivered by latest April 30 2021 and will be operating daily in the Kvarken region between the cities of Vaasa in Finland and Umeå in Sweden.